Each LNG carrier measures 288.0m in length overall (LOA), 48.94m in width, and 11.55m in draft. The 138,000 gross tonnage (75,000 deadweight tonnage) ship is capable of carrying up to 153,000 m3 of LNG (cargo tank total volume: 155,000m3) using four Moss-type* tanks. The Sayaendo features a peapod-shaped continuous cover for the Moss spherical tanks, integrated with the ship's hull, in lieu of a conventional hemispherical cover and enables greater structural efficiency and size and weight reductions, maintaining the ship's overall strength. The continuous cover over the tanks improves aerodynamics by substantially reducing wind pressure, which serves as drag on ship propulsion. For its main power plant, the Sayaendo adopts MHI's "Ultra Steam Turbine Plant" (UST), a new turbine plant which achieves higher thermal efficiency through effective use of thermal energy by reheating steam. Together with downsizing, weight reduction and hull line improvement, the new ship achieves a substantial 20% reduction in fuel consumption compared to conventional ships. In the conventional method, pipes, wires and catwalks atop the tanks were supported by complex structures. By covering the tanks with the integrated cover and making those supporting structures unnecessary, the new design also improves maintainability. In addition to CO2 emission reduction through diminished fuel consumption, the ship further enhances its responsiveness to environmental issues with the installation of a ballast water treatment system, addressing the impact on the marine ecosystem. Osaka Gas International Transport is a wholly owned subsidiary of Osaka Gas. 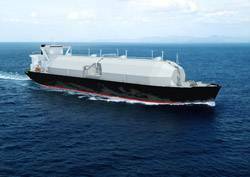 The two LNG carriers to be delivered by MHI will be jointly owned by Osaka Gas International Transport and Mitsui O.S.K. Lines, Ltd., which will function as the ship management company. Both ships are planned to be used for transportation of LNG procured by Osaka Gas. Presently, as part of the measures to prevent global warming, energy-savings and reductions in CO2 emissions are vigorously being sought in the area of international marine transportation. In response, the Japanese shipbuilding industry is actively developing "eco-ships" with enhanced environmental responsiveness. MHI positions eco-ships as one of the key high-value-added products which the company's Shipbuilding and Ocean Development business sector is focusing on with aims to expand lineup. Gaining momentum from the agreement to build Sayaendo, MHI will continue the aggressive pursuit of its activities in eco-ship development and customer expansion.